A new paper "A framework to analyse the implications of coastal transformation on inclusive development" has just been made available online in the journal Environmental Science and Policy. The paper, led by Natalie Suckall with co-authors Emma L. Tompkins and Kulima director Dr Katharine Vincent, is an an output of the IDRC and DFID-funded Deltas, Vulnerability and Climate Change: Migration and Adaptation (DECCMA) project. 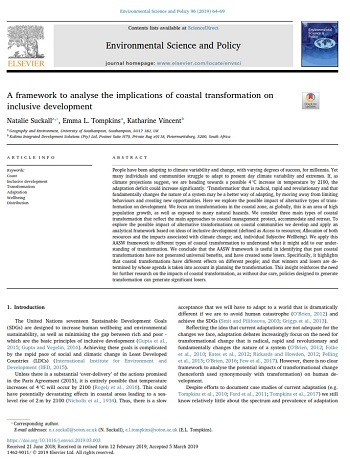 The paper applies an analytical framework based on ideas of inclusive development (defined as Access to resources; Allocation of both resources and the impacts associated with climate change; and, individual Subjective Wellbeing) to three different types of coastal transformation (protect, accommodate, retreat). It highlights that coastal transformations have different effects on different people; and that winners and losers are determined by whose agenda is taken into account in planning the transformation. This insight reinforces the need for further research on the impacts of coastal transformation, as without due care, policies designed to generate transformation can generate significant losers. This week Kulima is hosting a writeshop in South Africa for members of the UMFULA project (under the Future Climate For Africa programme). The writeshop will be attended by team members from the Grantham Research Institute on Climate Change and the Environment, University of Leeds and University of Kwazulu Natal. The aim is to compare, contrast and synthesise findings from research conducted in Malawi, Tanzania and Zambia. Planned papers relate to the political economy of climate change in each country, insights into effective and equitable adaptation options for small-scale commodity (tea and sugar) farmers, and analysis of how to best visualise climate information so that the intended message is effectively understood by planners. 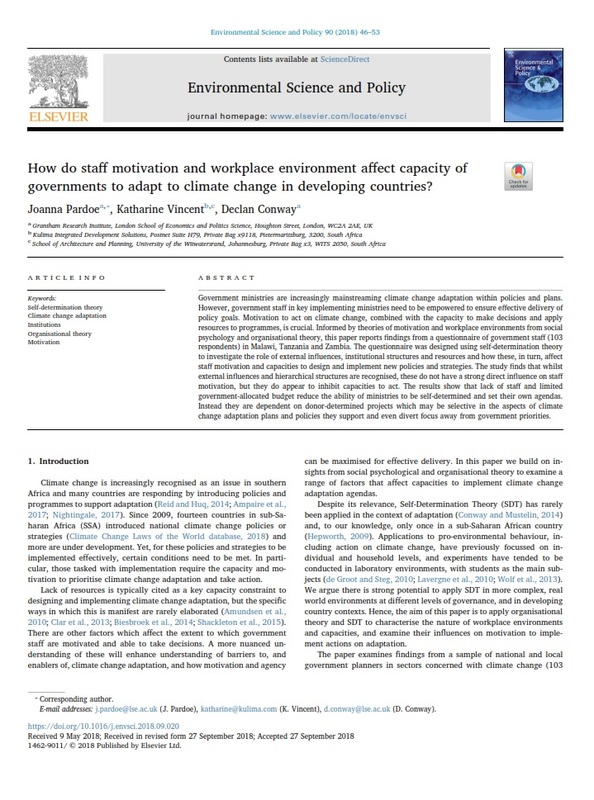 A new paper "How do staff motivation and workplace environment affect capacity of governments to adapt to climate change in developing countries?" has just been made available online in the journal Environmental Science and Policy. 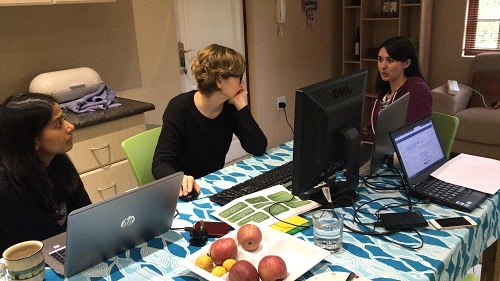 The paper, led by Joanna Pardoe with Katharine Vincent and Declan Conway, is an output of the UMFULA (Future Climate for Africa) project, and is based on self-determination theory surveys that were conducted with government officials in Malawi, Tanzania and Zambia. The study ﬁnds that whilst external inﬂuences and hierarchical structures are recognised, these do not have a strong direct inﬂuence on staﬀ motivation to respond to climate change, but they do appear to inhibit capacities to act. Lack of staﬀ and limited government-allocated budget reduce the ability of ministries to be self-determined and set their own agendas, as they create a dependence on donor-determined projects. A new paper "Communities of practice. One size does not fit all" is now available online in the journal Climate Services. 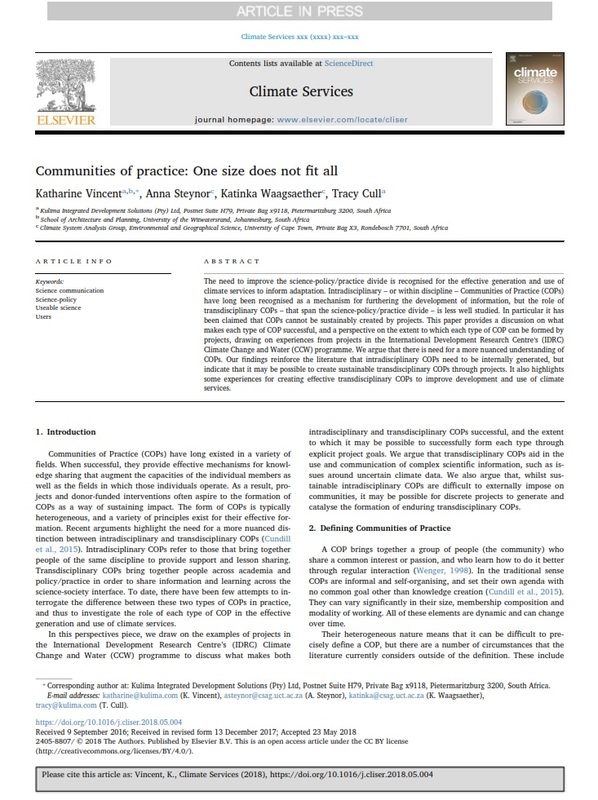 The paper, by Katharine Vincent, Anna Steynor, Katinka Waagsaether and Tracy Cull, furthers the argument for a nuanced understanding of communities of practice (COPs) that recognises the intradisciplinary and transdisciplinary variants. 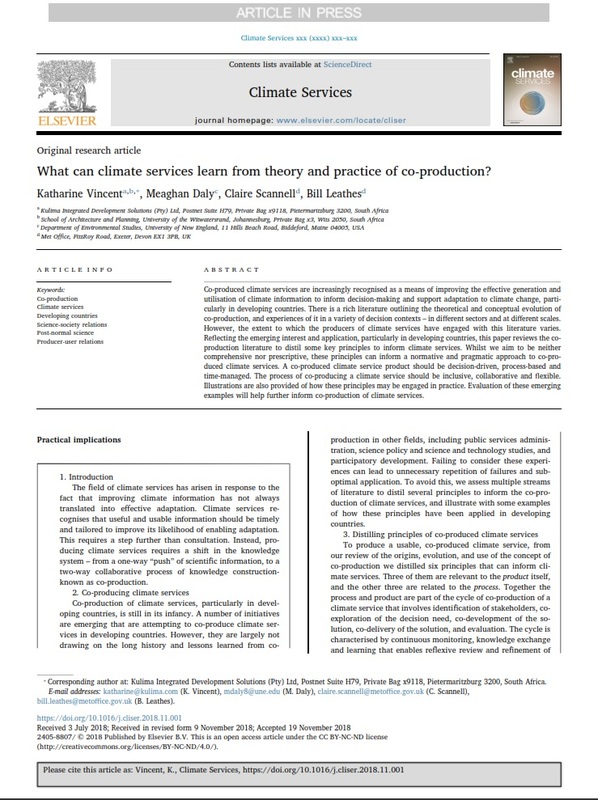 For successful climate services that enable adaptation to climate change, transdisciplinary COPs are typically required that bring together producers and users. This paper reflects on the role that donor-funded projects can play in supporting the effective generation of sustainable COPs. 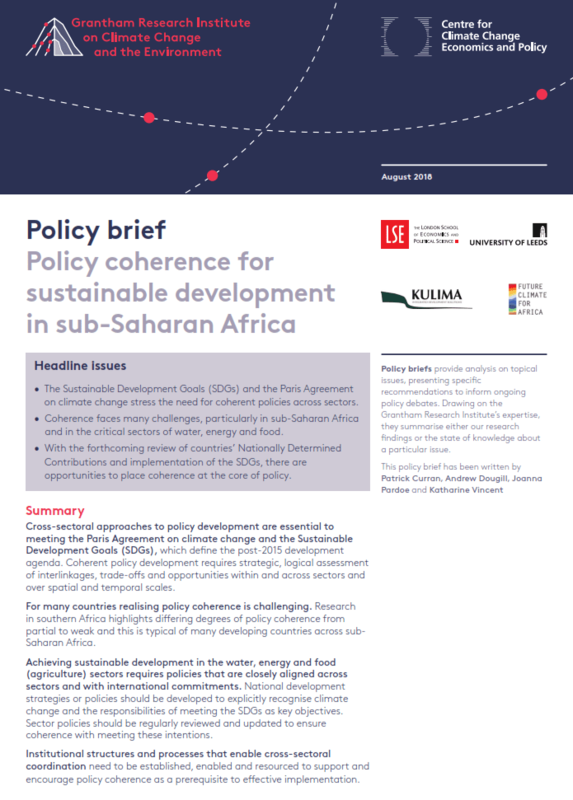 The Grantham Research Institute on Climate Change and the Environment (at the London School of Economics and Political Science) and the Centre for Climate Change Economics and Policy has just released a briefing note "Policy coherence for sustainable development in sub-Saharan Africa". The briefing note, written by Patrick Curran, Andy Dougill, Joanna Pardoe and Katharine Vincent, is based on a number of research papers produced under the Future Climate For Africa UMFULA project, which have looked at policy coherence in Malawi, Tanzania and Zambia. It highlights how sub-optimal levels of coherence of policies and strategies relating to climate change (water, energy and food) could threaten the achievement of the Paris Agreement on climate change and the Sustainable Development Goals. A new opinion piece "Documenting the state of adaptation for the global stocktake of the Paris Agreement" has been published in WIREs Climate Change. 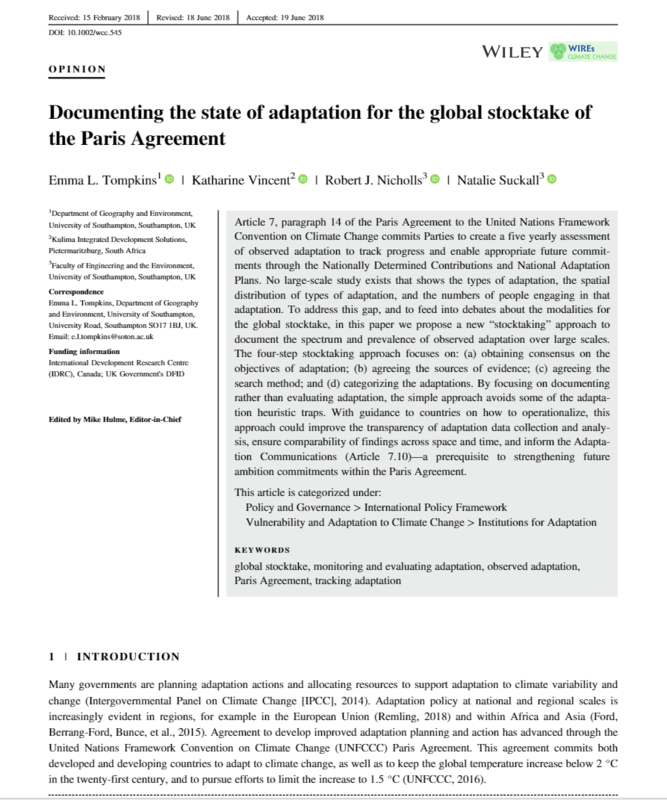 The paper, by Emma Tompkins, Katharine Vincent, Robert Nicholls and Natalie Suckall, proposes a stocktaking approach to document the spectrum and prevalence of adaptation over large scales, as mandated by the global stocktake of the Paris Agreement. The stocktaking approach is based on a method used to develop inventories of adaptation in four deltas within the Deltas, Vulnerability and Climate Change: Migration and Adaptation (DECCMA) project. It involves four steps: (a) obtaining consensus on the objectives of adaptation; (b) agreeing the sources of evidence; (c) agreeing the search method; and (d) categorizing the adaptations. The Centre for Climate Change Economics and Policy at the Grantham Research Institute of Climate Change and the Environment and the University of Leeds has released a new working paper as an output of the UMFULA project. Dr Katharine Vincent is an author of the working paper, entitled "Climate information needs in southern Africa. A review". 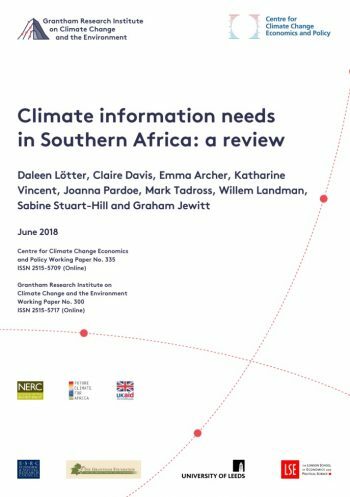 The paper reviews the state of the landscape of available climate information, barriers to climate information use, and the climate information needs of different sectors in southern Africa. It draws on published literature, documentary evidence and primary research with decision makers in the Southern African Development Community. A new paper "Developing and applying a five step process for mainstreaming climate change into local development plans: A case study from Zambia" has just been published in the journal Climate Risk Management. The paper outlines a process for mainstreaming climate change that was developed for use in the Pilot Program for Climate Resilience districts in western Zambia and applied during several workshops in 2017 for both district development plans and integrated development plans. The process can be used when planning from scratch and also when retrofitting existing plans. 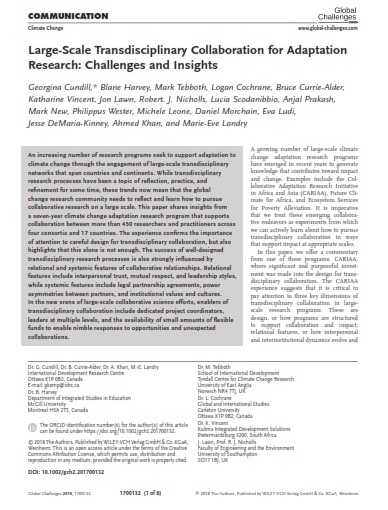 A new paper has been published in the journal Global Challenges on "Large-Scale Transdisciplinary Collaboration for Adaptation Research: Challenges and Insights". Led by Georgina Cundill from IDRC, with inputs from Katharine Vincent, the paper highlights experiences of the consortia of the Collaborative Adaptation Research in Africa and Asia programme – including Deltas, Vulnerability and Climate Change: Migration and Adaptation, on which Kulima is a partner. The paper highlights how the success of well‐designed transdisciplinary research processes is strongly influenced by relational and systemic features of collaborative relationships. In the new arena of large‐scale collaborative science efforts, enablers of transdisciplinary collaboration include dedicated project coordinators, leaders at multiple levels, and the availability of small amounts of flexible funds to enable nimble responses to opportunities and unexpected collaborations.